The Nestle Peptamen Junior Complete Elemental Unflavored 8oz Can Each, Model #9871616253, is anchored in advanced science and research. Nestle Healthcare Nutrition offers nutritional solutions for people with specific dietary needs related to illness, disease states or the special challenges of different life stages. 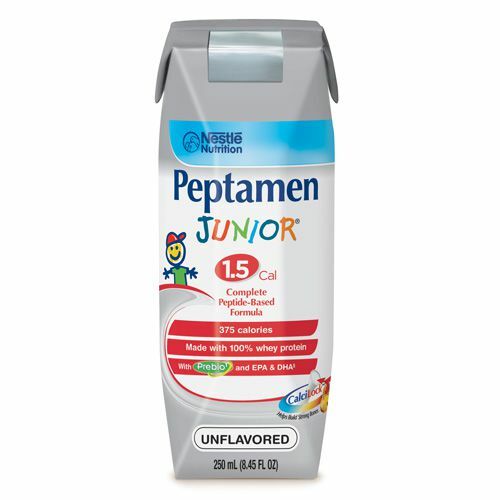 The Nestle Peptamen Junior Complete Elemental Unflavored 8oz Can Each is intended for the nutritional management of children with impaired GI function. Peptamin Junior is a nutritionally complete, easy to digest and easy to absorb formula to help support the nutritional needs of children with impaired GI function.